Vue on King William, set to become Adelaide’s tallest residential building, is just seven months from completion with the building reaching the topping out stage early this week. 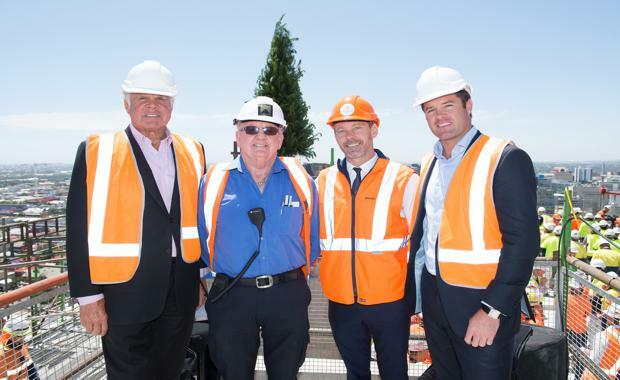 More than 200 construction workers gathered on the top floor of Vue on King William, 85 metres above the city, for the topping out ceremony. It was marked by a large Christmas tree being raised up from the ground to the top floor by a 125 metre crane. Construction on the 28 storey building started just 12 months ago and has taken 332,500 man hours to get to topping out stage. South Australian building suppliers have also benefited with 32,000 m2 of formwork, 740 tonnes of steel reinforcement, 7,500 m3 of concrete (approximately 1,500 truckloads), and 410 precast panels used for the construction. 8,000 square metres of glass has also been used. The $100 million, 210 apartment development is fully sold with the exception of one penthouse which will go to the market in early 2016. The demand for CBD living is rising with population forecasts showing the city’s population is set to grow this year to a 22,393 – a 52 year high. Starfish Developments Managing Director Damon Nagel said Vue was testament to the demand that exists for high quality, CBD apartment developments. “We started selling Vue in May 2014 and the first residents will start moving into the building just two years later,” said Mr Nagel. “Many of the buyers at Vue are planning to move into the city from the suburbs and the building will be home to a mix of young professionals and empty nesters looking to downsize and enjoy a low maintenance city lifestyle. Vue on King William is a joint venture between Adelaide-based Starfish Developments and Melbourne-based Asian Pacific Group. Vue was one of the first to take advantage of the state government’s pre-lodgement and design review process and was the first significant residential project to commence construction following introduction of the planning reforms. Developers are seeing the opportunities created by a rising acceptance of CBD living with Adelaide apartment approvals nearly doubling in the last three years from 1695 in 2012 to 3385 this year. Asian Pacific Group Chief Executive Officer Will Deague said since his company’s investment in Adelaide with The Watson and then Vue on King William, a number of other interstate developers had entered the South Australian market. “Every time I visit Adelaide I’m impressed with how the city is growing and evolving,” said Mr Deague. Vue will bring a new style of residential architecture to Adelaide with its 6 level podium, recessed Level 7 roof top garden, pool deck and recreation centre and 21 level glass tower. The building is due for completion in May 2016.